I don't have a hard time taking shots at Facebook, and piously talking about what a time-waster it can be. I know if I'm not careful it can be a big time-waster for me. But that doesn't mean everything about Facebook is evil. In fact, we should probably recognize that half the world is on Facebook; and probably far more than half our church is on Facebook. In some ways, Facebook has become what email was 15 years ago. So instead of condemning Facebook, let's try to think about how it can be beneficial. 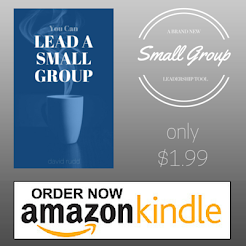 A while back I put together a PRIVATE (that's important) Facebook group for my small group. I invited/added all the members of our group (including those who aren't quite as faithful with their attendance), and have just sat back and watched to see how we used it. 1. What parts of God's Word have been on your mind recently? 2. What areas of your life has God been working on recently? 3. For what are you thankful this week? 4. What do you need from God this week? 5. How can we invest into your life next week? Most groups spend a large amount of their time studying or discussing a particular topic or Bible passage. While your launch team can make determinations ahead of time regarding the focus of the group’s focus, you can also allow the group to make that decision. A good time to have this group discussion is after the spiritual formation survey has been completed. 1. Discuss potential study formats and topics with either your LIFEGroup.